The Holidays are over and it’s a New Year. Time to pack up the decorations, get organized, and set goals for 2019. Maybe your auntie gave you an Instant Pot for Christmas and you’ve decided to prepare healthy meals from scratch. Maybe Granny splurged and gave you an Apple Watch for Hanukah and you’re resolved to walk ten miles a day—using your watch to track them. Whatever your goals and resolutions are, you need to add an extra one to the list: giving thanks. Writing Thank-You notes is one of the most precious and powerful habits we can develop as humans. A Thank-You note warms the heart of the person who receives it. It acknowledges their kindness and thoughtfulness and strengthens the connection between you. Thank-You’s on social media or spoken over the phone can be touching and wonderful, but nothing can replace setting ink down on paper. A handwritten note creates a personal heirloom that shows how much you value the recipient. Auntie can’t put a tweet on her mantlepiece and show it proudly to visitors, and no matter how hard she tries Granny can’t lovingly place a Facebook message in the keepsake box she stores under her bed. We’re big believers in expressing gratitude at Elūm. 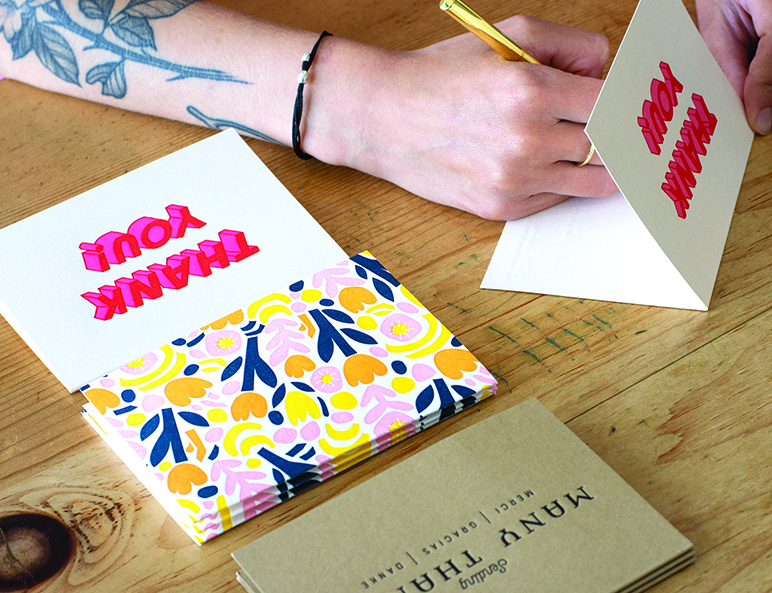 We know the idea of writing Thank-You notes can seem daunting, that’s why we make so many fun and whimsical Thank-You cards. A beautiful card printed on repurposed cotton rag paper with a simple and heartfelt message inside will never go out of style or be replaced with technology. It represents time and thought. Its arrival in the mailbox creates warm and delightful anticipation, and a loved one can hold it in her hand and think of you. Around here we believe that’s some pretty powerful mojo. Last month an estate planner wrote to advice columnist Dear Abby. In her letter she spoke of the consequences she witnesses to folk who fail to write Thank-You’s to relatives. Time and time again she sees grandparents and family members disappointed that their generosity has gone unacknowledged. After taking the time to pick out a thoughtful gift or send a small check to help cover expenses, wouldn’t you want to be thanked? We have two rules for writing Thank-You’s: Keep it Fun. Keep it Real. Writing your message is where the Keep it Real rule kicks in. No thesaurus, no cut-and-paste. Just a couple of sentences from your hearts to theirs. 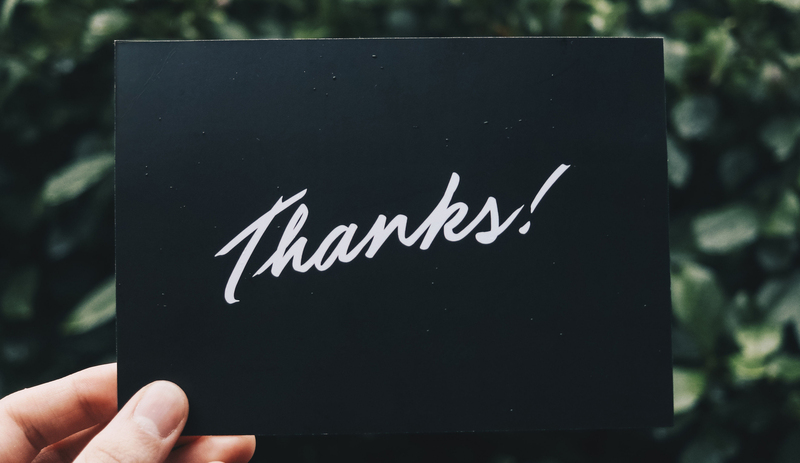 The simple and easy trick to sounding like your true and authentic self when writing a Thank-You is to imagine the recipient is standing right in front of you. Write down exactly what you would say to them. Auntie, I love the Instant Pot. Thank you! I’ll be thinking of you every time I cook a healthy meal. Miss and love you, Ashley. You don’t have to be a great writer, you just have to speak from your heart. Dear Granny, I put your photo on my Apple Watch so whenever I check the time I see your face. Sending you kisses for every hour of the day. Love and thanks, Jess.